Logan Framer's Edge Elite Mat Cutters are designed for professional artists and framers who want a cost effective yet versatile machine that can handle both high production jobs and small projects. Crafted of durable, heavy-duty materials, they withstand the rigors of professional mat-cutting with ease and accuracy. Every Framer's Elite Edge machine boasts a nonstick-coated cutting bar that needs no lubrication. A single-pull, dual cutting head provides both bevel and straight cuts and has the ability to handle four-ply and eight-ply mats with ease. Lifetime-guaranteed Delrin bearings offer smooth operation over the long haul. These state-of-the-art machines are built on a sturdy base crafted of ¾" (19 mm) composite board surfaced with durable, easy-to-clean laminate. A hinged guide rail, parallel mat guide, and three movable production stops enable quick, accurate operation with border measurements. Work with your choice of two squaring arms: the 32" (81 cm) arm for making straight cuts or the 9" (23 cm) arm when space is tight. Ten #269 replacement blades are included. The Framer's Elite Edge also accepts #268 blades for eight-ply mat cutting. FREE BONUS — As a special bonus, receive a FREE 96-page home picture framing book with purchase. Blade #269 — For use with Logan Framer's Edge Elite Mat Cutters, this all-purpose blade is for cutting standard thickness matboard. Blade #268 — For use with Logan Framer's Edge Elite Mat Cutters. For use when cutting 8 ply mat board. To view a PDF of the Instruction and Operation Manual for the Logan Model 650 Framer's Edge Mat Cutter, please click here. ® Logan is a registered trademark.® Delrin is a registered trademark. 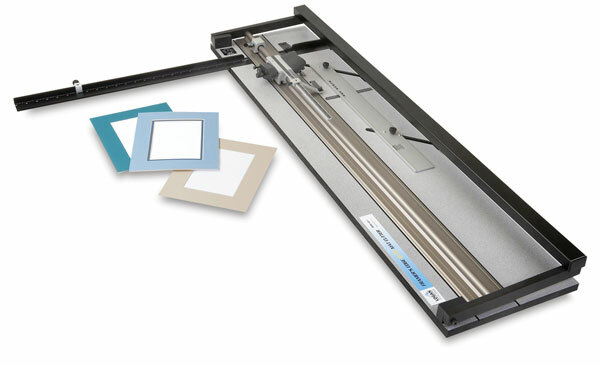 Logan Framer's Edge Mat Cutters have many features of high-volume production cutters that one would find in a framing shop, yet they are lightweight and compact. The 8" movable production stop allows the bevel head to cut all 4 sides without re-adjusting the cutting bar stops or marking the mat. Cutting bar stops are adjustable for borders up to 8". The automatic lock-down pin on the straight cutter holds the blade in position, and offers 3-position depth adjustment. An indicator gauge eliminates overcuts. This video shows all the features of the Logan 650-1 Framer's Edge Elite Mat Cutter, including how to assemble and use it. This "do-it-yourself" video explains all the steps of cutting a professional looking mat for your artwork. We begin by showing you a simple formula for measuring a window opening for perfectly even sides — and the best practices for getting clean edges when cutting your matboard.